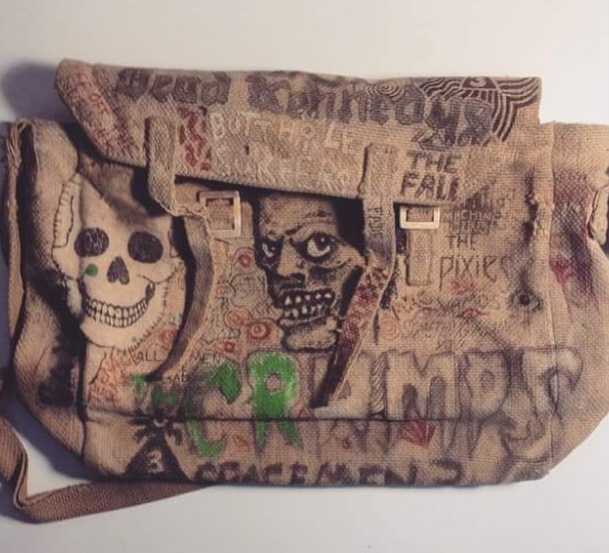 Will Sweeney, artist and illustrator, on his old school bag. GB Tell me about your school bag and why it’s beautiful to you. WS It’s the bag I had when I was a teenager in Oxford, around the time of my GCSEs, from about the age of 15 – 17; 1988 – 1990. It’s decorated with lots of hand drawn band logos, song lyrics, people’s phone numbers and stoner doodles. I think it’s beautiful to me because it represents a time in my life when I was filled with teenage rage (to quote The Cramps) – energy and the excitement of discovering all sorts of things…music, girls, festivals, drugs, art, comics etc. The world had rapidly got a lot bigger for me in a short space of time. GB I guess beauty didn’t play a big part in the creation of it? Is it more beautiful in retrospect? How did you hold onto it for so long? WS Thats probably true, I think the motivation to draw all over it was to express my passion for the music I was listening to and to try and come across as cool and interesting or whatever, as many teenagers do. I guess it’s beautiful to me now because it looks authentic, it’s sort of contrived in a desperate, teenage way, but that in itself has a kind of beauty. Without wanting to be too nostalgic, it’s also beautiful because it directly reminds me of people, places and events from what was generally a very happy time for me. I’m not sure if I originally intended to hold onto it, it was in a box in my mums attic along with loads of NME clippings, letters and other stuff from that time and I found it about 15 years ago, it was a bit of a blast from the past. GB Tell me about the bands? Do you ever listen to them now? Were the Cramps your favourite – or did they just have the best logo? What’s the soundtrack to your life at the moment? WS The Cramps were and still are my favourite band, they are a conduit to so many other things that I’m into. They covered lots of obscure rockabilly, garage and early punk stuff that I went on to discover as I grew older. They were also really unique in that they didn’t fit neatly into any one scene or subculture but influenced a wide range of artists and bands. Also their graphics; posters, T-shirts and record sleeves were hugely important for me and are still some of my all time favourite images from rock n’ roll history. One of the funny things for me about the bag is having Spacemen 3 and Loop alongside The Dead Kennedys and The Cramps; on one hand I would be listening to Spacemen, sitting on a paisley cushion, smoking a badly made joint with my posh mates from the private schools, and then I was also walking around listening to Dead Kennedys on my walkman, hating the government and reading class war. That teenage period is great when many kids discover this huge appetite for wildly contrasting types of music and love all of it, I was a bit of a hippy, a bit of a punk, a bit of a goth. I still listen to all of the bands on the bag, I dj a bit now and play all sorts; a lot of techno, strange disco, reissues of lost ethnic nik naks, there’s still loads of amazing stuff to discover now. GB Did you know already that you wanted to be an artist, in 1988? WS No, I wanted to be a musician, I was in loads of bands and I really wanted to do that full time. My dad is an artist and he gently encouraged me to draw more and to pursue it in school as it was really the only thing I was any good at. It was quite hard work to get into art school for me and once I got into Liverpool I realised I wanted to be better at drawing and creating images and I gave up playing music. GB You still work with fashion and music. Do you think there are still the same subcultures as when we all liked these bands? They really were an alternative to the mainstream. Do you hope that your work appeals to a subculture or to everyone? WS I think subcultures still exist but in a very different way. I miss the counterculture we had in the UK when I was growing up, the first time I went to Glastonbury in the late 80’s was mind-blowing, there really was an alternative. I think what happened with rave culture in the early 90’s – the way the government clamped down on it and how the traveller community was systematically persecuted changed the counter culture in the UK in a massive way. Unfortunately, now it seems that youth culture has been commodified and infiltrated by marketing people to such a degree that its difficult for subcultures to really grow and develop in physical locations, but of course they grow in virtual spaces. I do miss those times but that was the analogue era, we are in the digital age now and everything is different. I would like my work to appeal to a wide range of people for sure, I don’t want to exist in any kind of fashion bubble. GB Your own work is beautiful. Do you intend it to be? You present quite dark themes of aliens and hybrids and death – but the overall effect is so visually stunning. WS Thank you. I think so… I like to imagine alternate worlds, labyrinths and different sets of rules or natural laws, so I suppose there’s an attempt at creating beauty in those things, at the same time everything is rooted in reality and the influences I take from the world around me; learning to draw from reality, the ugly and the beautiful – gives me the building blocks to imagine a different world. GB Do you see any difference in the way your work is perceived when it’s on a T shirt or in a gallery? Does the context matter? WS Yes, it’s quite different. T-shirts usually require more immediate, bold ideas to work well and be wearable, whereas in a gallery show I can explore more whimsical, fully rendered ideas. Working for print or clothing is interesting as you never quite know how something is going to turn out and what context it will be seen in – or how popular it will be. Some things resonate a lot more than others. Showing original drawings in a gallery, I have a lot more control over the actual artefact and it there is a more direct connection between the viewer and the artist. Clothing work tends to be more anonymous but this can also be a good thing. WS Beauty can be something or someone that is a trigger or a doorway; a glimpse into another world which explodes upon your conscious mind in an instant and fills it with possibilities.